Sometimes we find ourselves wrapped around someone’s little finger and caught up in their drama. What is manipulation, and how do we cut the emotional cords that attach us to the unhealthy stuff in our lives? The solution is not a difficult one, but the work involved is demanding and exhausting. The first step to making any kind of change in our lives, is recognizing the need to take better care of ourselves. Making a commitment to You and pledging to honour that dedication will take courage, stamina and faith. For most of us making a promise to someone else is so much easier than it is to follow through on a promise to ourselves. When is it time for you to get serious? If there are people, circumstances or events in your life that are distorting the truth of who you are, then this is considered manipulation. When you are being misled, exploited or influenced in a way that doesn’t feel good to you, then something or someone in your life is using manipulation to steer you away from seeing the verity of things. 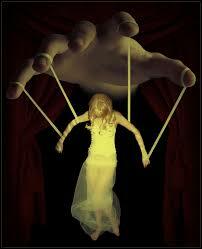 Another way to understand manipulation is to rely on your intuition. If something doesn’t feel right, then it very likely is not. If you are getting a negative gut feeling, your intuitive nature is telling you not to accept the situation at hand as true. Our Soul works in accordance with truthfulness, sincerity and honesty. This is why we get those gut feelings in the first place. They are little messages and whispers from our Inner Being to help steer us back to our path again if we have ventured off in the wrong direction. Listening to our intuition doesn’t have to be burdensome—what gives us the most difficulty is dealing with the truth. Recognizing anywhere in our life that the truth has been hidden is scary. It is frightening because that recognition would mean that change is necessary. As human beings we are petrified of anything that we have to change. What is important to remember is this: If we keep getting those negative intuitive feelings, then ultimately something has to give. Changing things in our lives is necessary if we want to move forward with the evolution of our Soul. The very purpose for which we are here on this earth is to learn, grow and expand our consciousness. Manipulation is often a means by which to keep you right where you are, and it is always because that person or situation is fearful of the very same thing you are: change. Be your own hero. If there is something in your life that you need to alter, adjust, modify or revise, then get to it. Be the leader, and if others are meant to follow, they will, or they won’t. If you feel like you have swayed a little to far to the left, then make some changes to get you back on the “right” road to “joy rising”.